I Wonder - JESSI Exceptional Search Services Inc. Recruiting offers the opportunity to help companies through growth and change. JESSI Search works with leaders at the best of times and during the most uncertain times in their business. This experience provides a look into different leadership styles. Some are truly admirable, gaining great results. JESSI Search enjoys growth led by new, returning and referred customers. The change and challenges of recruiting offer the chance to reflect on the best leaders and styles, especially during challenging times. 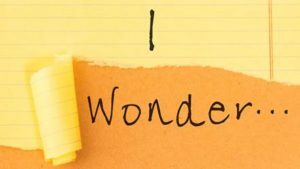 Take a minute to ask yourself and your team, “I wonder…. ?” Or, find a couple of items that strike you and try them out!